Alan Turing spent most of the years 1937-38 at Princeton University, based in the world-leading research group in mathematical logic headed by Alonzo Church. See the administrative documents made available by Princeton University. He lived in the Graduate College. Princeton University had become a great intellectual centre, absorbing exiles from a Nazifying Europe, and great future developments in mathematics, science and economics were started there. In particular, Turing renewed contact with John von Neumann there. (They had met in Cambridge in 1935). The oral history project of the mathematics department marks the importance of this period. The interview with Alonzo Church draws out rather little regarding Turing, whom Church calls 'a loner.' He was indeed, but Alan Turing had quite a good social life at the Graduate College, and also travelled between South Carolina and New England. He did not, however, find any way of satisfying his need for a sexual relationship. This was a period when he yearned for young men around him — particularly Maurice Pryce —but they were all unattainable. The Cambridge mathematician G. H. Hardy, also gay, was a visitor while Turing was there. Hardy became famous for his view of 'pure' mathematics. In a piece of writing on Cambridge Scientific Minds, I have described more about the similarities and contrasts between Hardy and Turing in mathematics and life. A fine drawing by the artist Jin Wicked. It subtly represents the conflicts in Alan Turing's life after his discovery of computability. The work he did in 1937-8, his most difficult and most abstruse, charted new territory in trying to bring the uncomputable into some kind of order with 'systems of logics based on ordinals'. We shall not go any further into the nature of this oracle apart from saying that it cannot be a machine. The whole point of the 'oracle' is that it is a mathematical tool for the analysis of what cannot be done mechanically. Since the 1950s it has become a standard idea ('relative computability') of mathematical logic. The philosopher B. J. Copeland has rather absurdly claimed that Turing would have supported a project to 'construct' machines equipped with oracles, and holds out the prospect of 'the biggest revolution in computing since 1948.' See a comment on Copeland's picture of an oracle. Turing may have taken the word 'oracle' from Shaw's science-fiction play Back to Methuselah . The oracle is a fount of superhuman wisdom in the imaginary future of the year 31920. Turing was a great fan of Bernard Shaw's plays, and had seen a production of Back to Methuselah at Cambridge in 1933. 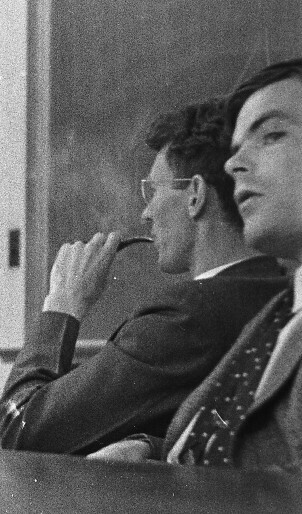 On the right is a rare snapshot of Alan Turing in a seminar at Princeton at this period. The most accessible introduction to the concept of infinite ordinals, on which Turing's work on 'ordinal logics' was based, is in Infinity and the Mind , by the mathematician Rudy Rucker. In a curious twist, Rudy Rucker published a science-fantasy novel in 2012, called Turing and Burroughs . Turing's work at Princeton also involved work on complex analysis and the Riemann zeta function. Turing hoped to locate a zero of the Riemann zeta-function off the critical line. An article by the number theorist Dennis Hejhal explains the mathematics of the zeta function and links it to Alan Turing's life. This article appeared in the Mathematical Intelligencer in 2007. The book The Music of the Primes, by Marcus du Sautoy, also discusses the history of the Riemann Hypothesis (Hilbert's Eighth Problem) and what Turing achieved. Turing's setting in Princeton in this period of the growing Nazi threat has inspired a passage in the novel Cryptonomicon by the (science)-fiction writer Neal Stephenson. Turing's work on 'ordinal logics' was completed in 1938 and successfully submitted as a Ph.D. thesis. As a result, you can trace his 'genealogy' on the Mathematics Genealogy Project. It runs back through doctoral supervision to Church, Veblen, E.H. Moore, H.A. Newton, Chasles, Poisson, and Lagrange. Stretching the definition a little, the line goes back to Euler, Johann Bernoulli, Jacob Bernoulli and Leibniz, who can be said to have started symbolic logic. Alan Turing did not like using the title, but when he next returned to America, in very different circumstances, he found it essential. See this report where he made a joke of his title "Dr A. M. Turing, Ph.D."
Alan Turing's mother was much amazed at the sprinking of international correspondence that now ensued. Once a letter came from Japan! 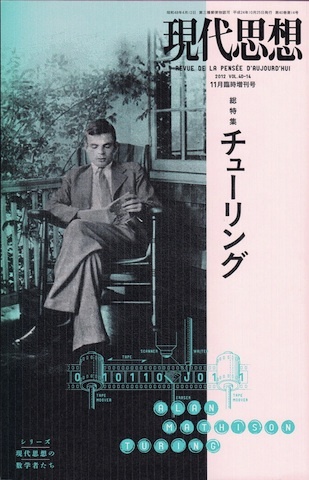 She would hardly have guessed in 1938 that this family album snapshot of her son would grace the cover of a Japanese publication in 2012. But she did keep all his letters from America, and in 1960, when she understood much better how visionary his work had been, these formed the nucleus of the Archive in King's College, Cambridge. Alan Turing could have stayed in America. He was offered a post-doctoral position by John von Neumann. This was nothing to do with computing or computers. It was because Turing had also done new research in the theory of continuous groups, which was von Neumann's leading research area. It is unlikely that they ever discussed computing. See source documents on What von Neumann knew of Turing in 1937-39. He could have been a pacifist exile in America. But he chose to return to Britain and to war. When back at Cambridge, Turing designed a machine with moving cogwheels to sum a Fourier series for the Riemann zeta-function. See the blueprint in the Turing Digital Archive. It was partly inspired by the Liverpool tide-predicting machine. Turing was assisted in the engineering of the machine by Donald C. MacPhail, a Canadian engineering student then at King's College, Cambridge, and also brother of Malcolm MacPhail whom Turing had known at Princeton. He had a grant of £40 from the Royal Society for the construction. See the document detailing Turing's application. This article by Bill Casselman in the Notices of the American Mathematical Society, 2006, gives a detailed account of the machine. 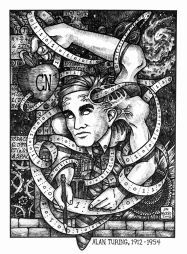 Turing's work in logic had already stimulated an interest in cryptography. He had also built actual physical machines. At about the time of the Munich agreement he began helping the British government with the problem of deciphering German communications. From now on, the finite, practical, human logic of the Enigma cipher machine came to dominate his life. From now on he served the State. No-one could have guessed where this would lead, not even Ludwig Wittgenstein with whom Turing argued about the philosophy of mathematics. See Wittgenstein's Lectures on the Foundations of Mathematics, Cambridge, 1939 for a transcript. Turing and Wittgenstein did not discuss the philosophy of Mind, then or later. Many people have wondered what they would have said to each other. John Casti has written an imaginary conversation, The Cambridge Quintet, involving such a dialogue. 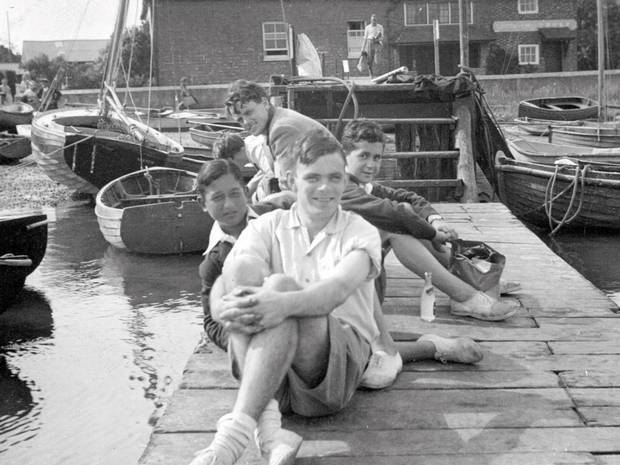 The real Alan Turing in late August 1939, sailing at Bosham, Sussex. Behind him is Fred Clayton, another young Fellow of King's College, Cambridge. Between them are two refugee boys, Robert and Karl from Austria. Alan Turing and Fred had helped them to find asylum in Britain. While they were there the pact between Hitler and Stalin was signed and war became inevitable. The coming of war meant that Turing never again concentrated on mathematical logic, and he did not follow up the ideas he had in 1937-38. The war exiled him from the opportunity to develop his advanced mathematical ideas, when he was at the height of his powers. Something was lost. But something else was gained: a connection between the logical and the physical. An article by me, The military use of Alan Turing, explores Alan Turing's personal and moral position, as well as his intellectual work, at the time when he decided to give himself to the struggle against Nazi Germany. Continue to the next Scrapbook page.